More like the wingnut state with the giberish Guns Over people tea potty lies and talking points parroted here. Anyone that has to ask this question must be following cnn or msnbc for the last six years. 999 out of a thousand will never read those labels. But Chicken Little say. The Sky is Falling, The Sky is Falling! The Average Nanny not have enough education to understand all that information anyway. Now how did we all get this far without all those labels on food products? I think more people read the labels then you think. Think about the diet industry in the US. Think about the billions of dollars people spend on losing weight. And think about how most of those weight loss programs involve looking at labels for some number reported there (Calories, Carbs, fat, whatever). Now think of all the people with milk, peanut, soy or gluten allergies. All of them look at labels too. Many more then 1 in 1000 pay attention to labels. My son's dairy intolerance means that I do. I imagine the number is more like 1 in 2 or 3. With the recently exposed info about industry research to find the "bliss point" that promotes an addiction response to sugar/fat/salt, this is long over due. Advertising such products in schools only serves to get children addicted to their garbage at an earlier age. It also serves the interests of diabetes, acid reflux, and other obesity related drug sellers, and corporate healthcare providers. Don't we want the government to tell us what to do, how to do it, when to do it, etc.? Don't we want the government to control ours lives and provide everything to us? Didn't President Obama say it was government's responsibility to make everyone's life better? e person of our choosing? It seems that it OK for the governnent to tell what to do on those occasions but when the government moves to better inform the American people about what they eat regarding the ever growing supply of processed foods. Ask sensible questions instead of questions that merely echo TEA/GOP talking points. And you people want to trust the government? The ignorance is simply astounding. I trust the government more then I trust big business. That's the part the anti-government people miss. It's not about if the government is trustworthy. It's if they're more trustworthy then those they are regulating. I believe the government is more likely to tell me what's really in the food I'm buying then the businesses trying to sell me the food. Look at how long the tobacco industry fought the government on cigarettes casuing cancer. Look at how the oil companies are fighting to deny global warming. Businesses are trying to make money... and if lying to their customers and getting them to put harmful stuff in their bodies will make them more money... that's EXACTLY what businesses are designed to do. The headline shows how out of touch cnn reporter are or how much they ignore when it comes to obandon. Look at Russia when it was a communist state and what was controlled. Now look at America and where it is heading. Game set and match, anyone wondering if obandon is a socalist, open your eyes. Game, set match. You lose. People are obese because they eat more calories than they burn off. That is all there is to it. You are taught in school, all about calories, good foods, etc. so you should not need color coded labels. But I digress, liberals always need a villain. That way, you, the sucker, I mean potential voter, can be a victim and feel blameless. So blame corporations, the 1%, the tea party, straight white men, and food stamps that tell you to buy Cheetos instead of cabbage. Hey liberals! Ya know what you left out? The silverware industry! Yeah! Those knives forks and spoons are making you fat too! And don't forget the evil corporations that make plates and bowls too big! God forbid you just quit stuffing your fat face and exercise a bit. Umm... that's the point of the change. The new labels emphasize the calories and make serving sizes reasonable (no more "1/3rd of a donut" serving sizes). The entire point of the change is so that people can SEE the amount of calories easier so they can keep track of how much they're actually eating. Nothing in this change takes away the individual being required to make a choice on how healthy they want to be. It simply gives them better information to make that choice. You seem to want them to make that choice without having information. Why on earth are you arguing for making it harder to find out what's in the food you're eating if you readily admit the problem is the amount of calories in the food people are eating? Seems kind of an odd position to hold. Just like the word "socialism," it doesn't look like repubs understand what the term "Nanny state" means. Providing information is not regulating. They are so obsessed with these terms, it's almost like they really want it. They don't understand that a truly free market works when the consumers are informed of what they're actually buying, and they don't want that apparently. Providing information about what is actually in foods is in no way nannying the populace. It's simply forcing businesses to be honest with the consumers about what is in the foods they sell. I'm all for the government keeping private industry from lying to us. Not sure why anyone wouldn't want that. No ones forcing anyone to eat a certain way, the government is just making it easier to see what the nutritional content is. That's not Nanny state. Government a role in reducing obesity? That is a broad statement. Should the government strive to keep troops trim and fit or is that too Nanny statish? Putting labels on food is not regulating what you eat. Beyond that, the only real way the government can curb obesity in a Nanny-statish way is to keep people from eating at all. 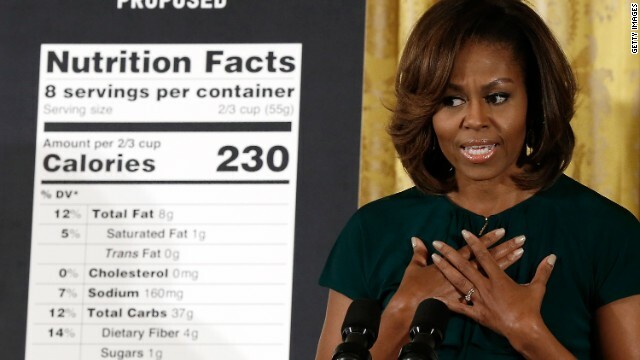 When Michelle Obama passes a law that makes it illegal to eat any food until a person's body fat percentage is low enough, basically the same tactic as the drug war, I will whine and snivel and emote like the the right wingers who do so now over the mind-bending prospect of the government mandating food producers provide consumers with more information on labels. yes it is already a nanny state, are you just noticing?? The government should not be anywhere they are not needed - our bedrooms, our living rooms, our foods! Does the nanny-state Democrats really think that by changing food labels, that that's going to change a poor person's eating habits and make them spend MORE on stuff they should be eating? I don't think so. When I was a kid back in the 60's and 70's, we ate everything - Twinkees, Donuts, all the fun stuff. The difference is that the kids nowadays do not exercise - they lay around and play video games and play with their thumbs on a smart phone every chance they get. Physical education has been eliminated in a lot of schools - I can go on and on. Until the kids go out and play and stay away from video games, they will be obese, plain and simple. So, Michele, stop already! The government shouldn't be "in our foods"? You're okay with your local starbucks or McDonalds putting rat poison in your cofee? You don't what the government to keep them from doing that? I'm actually fine with the argument that government should keep out of areas where they don't belong... but food regulation is one of the places they DO belong by any rational person's measure. The other problem is that HFCS is in everything these days. When you were a kid, it was probably in some of the stuff you consumed so it didn't do much. Today, it's difficult to find anything that doesn't have it in there, or you have to pay more for the things that don't have it. That's right Michelle. Stop your Move program encouraging kids to be more active. Sorry Al, you make no sense. When all you have is partisan hatred, you cannot see or hear anything. If you could, you would know Ms. Obama has been promoting a change in attitude away from exactly what you just complained about. If you pull your head out of Blimpbaugh's backside, you won't get so much manure in your ears. I cannot believe Newt Gingrich said that single moms on food stamps are obese, implying that they eat too much! They are obese because they can't afford to eat healthy food, you idiot! Healthy food is much more expensive! It's not because they are gorging themselves with all of the massive amounts of free food they are getting! How stupid! Single mom's on food stamps barely have enough food to make it through each month, you smug ignorant snob! Gingrich is a cancer on America. What he says should be deposited in his gold plated toilet that TEA/GOP donors bought for his hyper-inflated ego. only if they don't have a say in what i can smoke, who i can marry or what my wife, sister, daughter can do with their bodies. yeah don't think asking parents to not make their kids obese at the expense of the tax payer is being a nanny. now if you want to talk about telling me what i can smoke in my own home, who i can marry or what a woman can do with her body? yeah that's some nanny stuff right there! asking people to be aware of the crap they shovel into their face is not. Nanny state would be if we mandated what to eat. This just aims to give more understandable information about food. Like when you get a doughnut – you would think one serving is one doughnut but nope – it's only 1/3 of a doughnut and most people don't realize that. You are about 20yrs late on this story. Just more TEA/GOP talking pints. All nonsense. Better than a "Philistine" state where the Strong take the weak !!! There is nothing wrong with this. It is merely providing information. People are free to do (or not do) what they want with that info. Newt Gingrich needs a reality check. Of course women on food stamps are more obese. Obesity is something that tends to inflict the more disadvantaged or the most poor. It is cheaper to purchase sodium filled food or 10 pizzas for 10.00 than it is to buy a single red pepper for 3.64. When I have to try to make sure my children eat for the month because my income is limited, then I will purchase the food that will keep them fed and that is not the most healthiest foods. Frosted flakes is cheaper to eat than Koshi brand cereal. I say let people do as they please...remember Darwin and survival of the fittest? Those who are too ignorant to know what's good for them deserve what they get and we all win. and more oxygen for me..